We all know time is precious, but it’s even better when you find that out from a precious timepiece on your wrist. 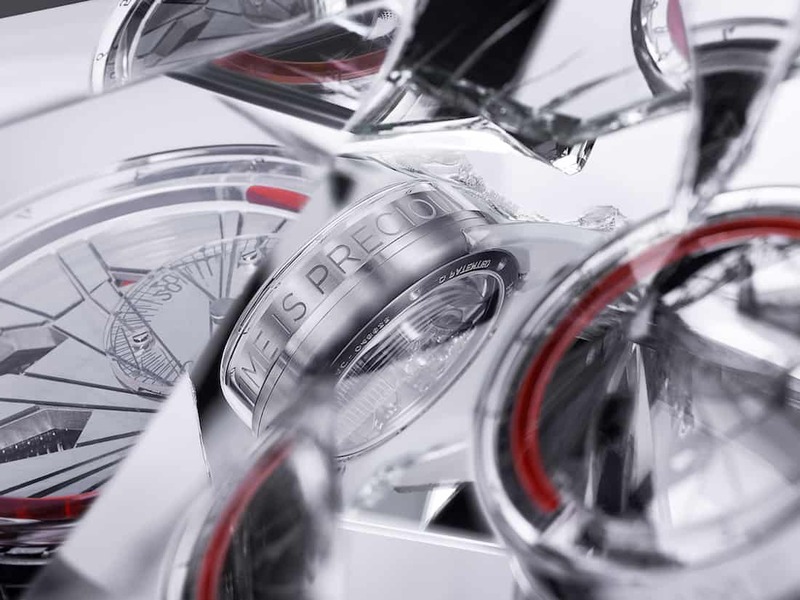 This is what HYT has been up to lately, crafting one impressive timekeeping device that reminds you about that. 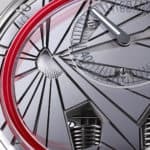 Unveiled just a few days ago, the HYT H0 Time Is Precious watch is the latest member of the growing H0 range of the acclaimed hydro mechanical watchmakers from Neuchâtel. The H0 range is known for its bold and non traditional designs, pushing the boundaries of watchmaking further away from what’s known to be possible with every new release. The brand’s new H0 Time Is Precious is more of an art form than its predecessors, with high end technology combined with their fluid display and novel casing. The wonderful sapphire case, that’s only 18.7 mm thick, continues with the laser cut dial boasting no less than 63 tilted facets, making the watch look avant-garde, futuristic, and totally unique. The watch, in its entirety, is more of a metaphor which speaks about the inevitable passing of time and the beauty of every moment in the chaos that life really is. The message ‘Time Is Precious’ is simply a reminder for cherishing every second of our time. 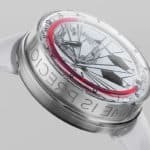 The 48.8 mm case comes with a stainless steel back and DLC coated crown. 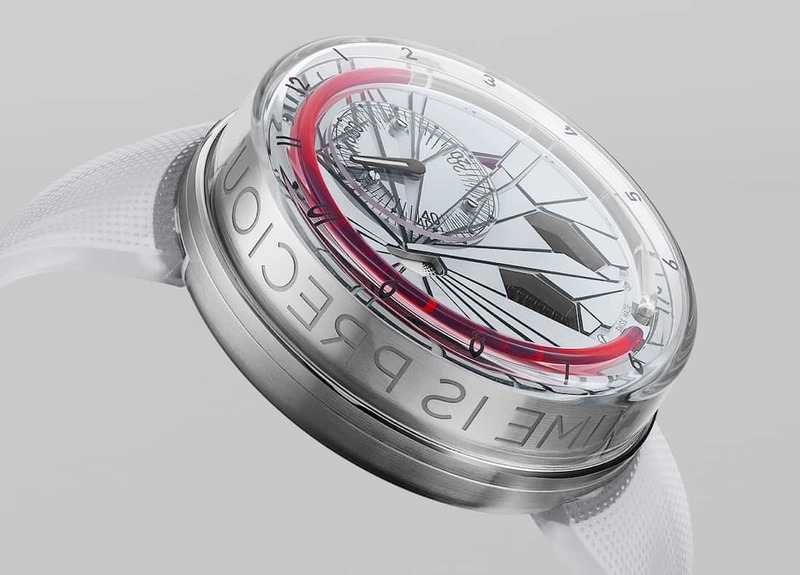 The dial features four windows, under which lie the 65 hour power reserve indicator, the seconds disc, and the two bellows which hold and let the red and clear fluids flow to tell the time. 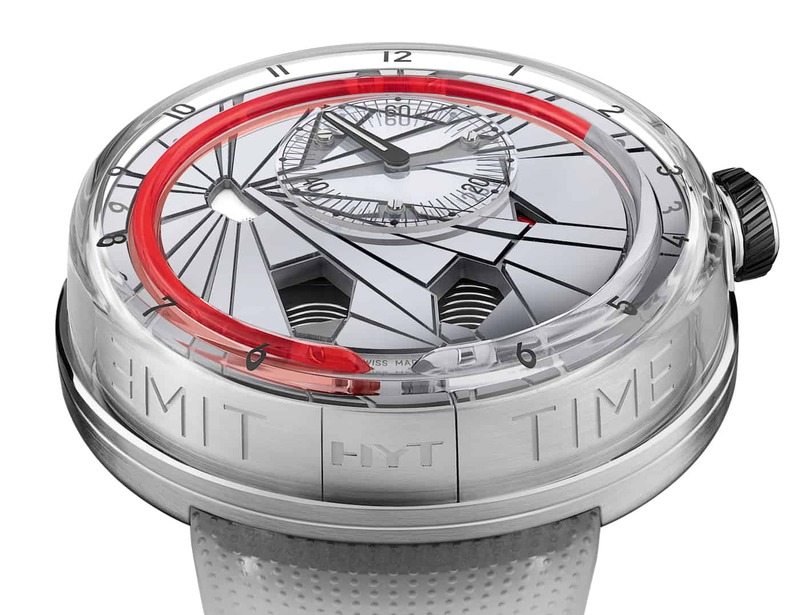 That’s another metaphor used by HYT, to serve us as a reminder that time is fluid. The hour hand is replaced by the two fluids in a round tube going around the dial. 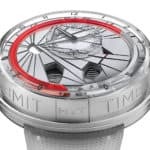 The HYT H0 Time Is Precious is a new limited edition release that comes in 50 pieces, each of them costing no less than $49,000.